As one of the most celebrated lakes in the world, Lake Como has been a romantic magnet of elite international tourism since the classic Grand Tour. In the 1930s, Greta Garbo, Hitchcock, and Frank Sinatra made the property famous not just for vacations, but as a scenic location for blockbusters, soaps and movies of all genres. Today, celebrities and dignitaries alike flock to the shores of Lake Como recognizing its beautiful treasured waters. Grand Hotel Tremezzo remains choice holiday destination, especially travelers seeking romantic accommodations. 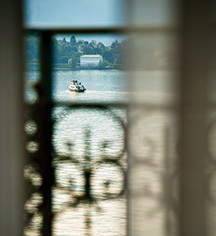 Grand Hotel Tremezzo, a charter member of Historic Hotels Worldwide since 2011, dates back to 1910. During the 1930s, Grand Hotel Tremezzo became a target for cosmopolitan tourism. Greta Garbo refers to Tremezzo as that happy, sunny place in the film Grand Hotel (1932). Payment: All forms of payment are accepted. Payment to be settled upon departure. Different policies may apply for bookings over a specific amount. Rollaways: Available upon request for children up to 12 years old; additional occupancy fee applies. Transportation: Transportation to golf courses may be arranged through the concierge; rates apply. 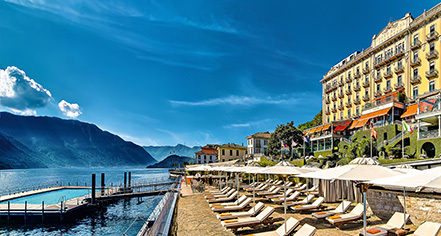 Immersed in the beauty of Lake Como offering a spectacular view of the glorious ancient town of Bellagio, and the surrounding Alps, the century old Grand Hotel Tremezzo is a treasured example of the finest authentic Italian-liberty Art Nouveau palaces. Learn more about the History of Grand Hotel Tremezzo .